For serious competitions, and the most fun you can have with Pitstop, you can play with Race Season Rules. You can find Race Season Rules on one of the rule cards that comes with Pitstop or on the rules page here on the web site. 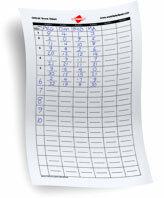 To play with Race Season Rules, you will need a score sheet to keep track of each race. You can make your own score sheet or you can download the official Pitstop Score Sheet in PDF format below. Once you have the file, use Adobe Acrobat Reader to print the score sheet on your printer. You'll get two score sheets on one US letter size sheet of paper. You may also be able to open the file in your browser. NOTE: You will need Adobe Acrobat Reader to view and print these files. Acrobat Reader is available free from Adobe.com.